One of the most important aspects of responsible gun ownership is storing your firearm. 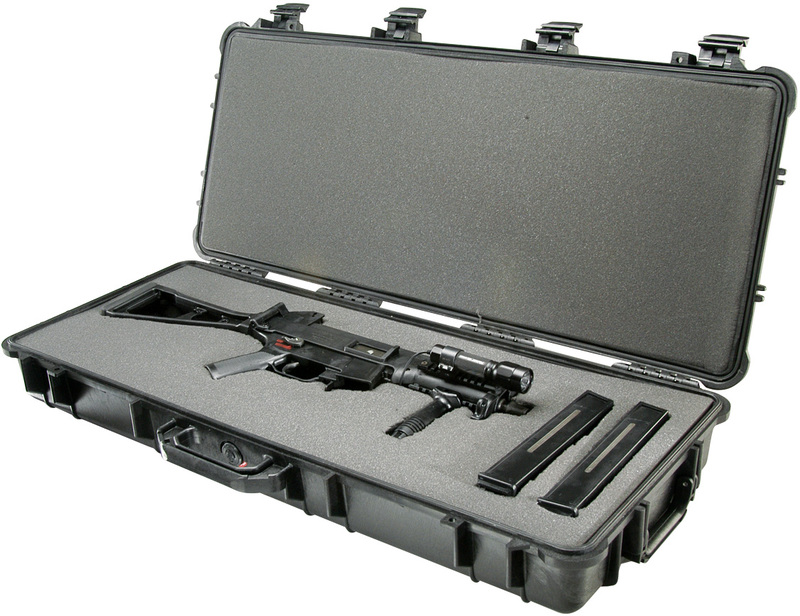 A hard gun case that can suffer abuse and stand the test of time, and that is what a company like Pelican is known for. Whether you have known about Pelican Protector cases, or just recently came across them as a result of a search, one thing that you may have noticed is that Pelican has an overwhelming number of choices. This guide will help you make sense of all those options so you can find the hard gun case that is right for you. We’ve all heard stories about companies that started out in garages and grew to be a huge success. Pelican Products is one of those companies. It began with the desire to create a flashlight case that didn’t leak underwater, and after the success of Pelican Float, the company soon blossomed to create legendary products like the SabreLite submersible flashlight and the Pelican lines of Protective Cases and ProGear that keep valuable and sensitive equipment safe, clean, and dry. Pelican Products started in 1976 with one product in mind, but now they are a world-wide company operating in 21 countries. They produce high-performance protective cases and advanced portable lighting systems for professionals in the world’s most demanding field including fire safety, law enforcement, military, and aerospace. Their products are suitable for industrial and consumer use, and are built to last. The Pelican Protector Case series is the company’s premiere line of protection for sensitive equipment, from cameras and laptops, to high-powered rifles. These cases are designed to withstand everything Mother Nature, your buddies, and even your grandkids can throw at it. Pelican Storm Cases are similar to the Protector line. The main difference is that they have a Press and Pull latch that automatically locks, yet opens with a light touch. There are several other differences that may appeal to you as a gun owner, including preformed foam. Pelican Storm Cases offer the same protection and durability you get with the Protector. I cover these gun cases in another guide. Pelican’s Mobile Military line is worth checking out if you have a military mindset, or an arsenal in your basement. 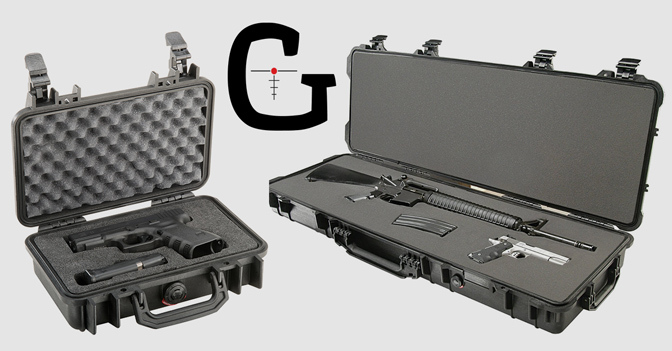 These transport cases are designed to carry just about anything the military needs to tote, from servers to grenade launchers, to anything else needed in the field. These come with similar specs to the Protector series, but designed to fit such things as an M24 with a night vision scope. 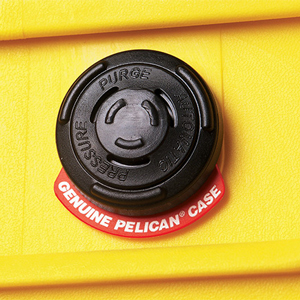 Pelican Protector cases come with an automatic purge valve. This valve equalizes air pressure inside the case to keep sensitive equipment stabilized and protected. Some of the larger cases, like the Pelican 1770 Transport Case has two of these valves which help compensate for the sheer volume of interior space. 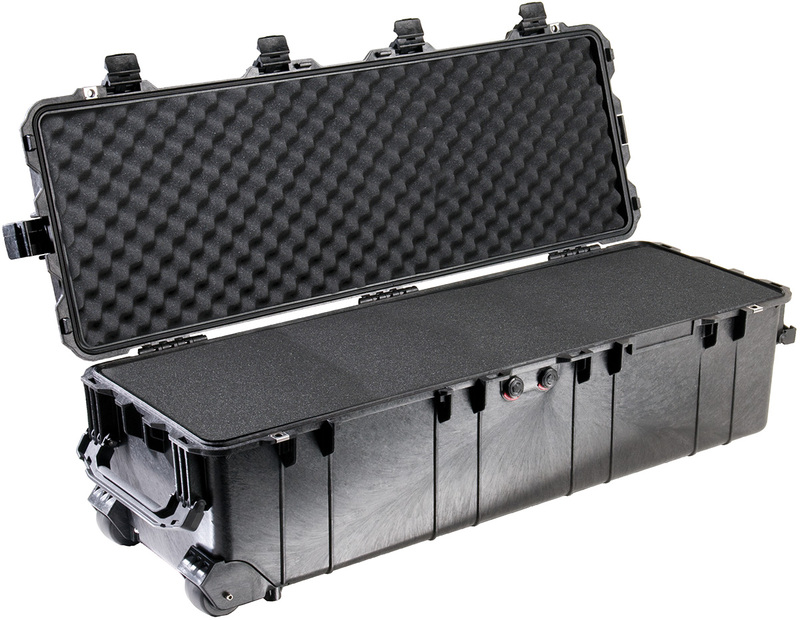 Pelican Protector Cases have over-molded handles and stainless steel hardware. You’ll get a sure, comfortable grip. And the simple, yet strong double-throw latches stay shut. They’ll only open when you want them to. This will ensure that the case doesn't open when it slides around the back of a pickup or you toss it to your buddy. A watertight silicone O-ring offers an instant seal all the way around the case that keeps moisture out. Leave it out in the rain, drop it in the creek, or whatever stupid thing you do, you don’t have to worry. Water isn’t getting past that seal. Pelican guarantees that the O-ring seal is watertight to a depth of 3.3 feet for 30 minutes. When choosing the right case for your gun the best place to start is the size of your firearm. The length of your firearm will determine the size classification. If you have a pistol, you’ll be looking at something in the small or medium range; rifles and shotguns will only fit in long cases (unless you store them in pieces). If you want to store multiple firearms in the same hard shell case or firearms with scopes, then you’ll have to do some measuring and compare the results with the interior space of the case. The same goes for storing extra ammunition, binoculars, gun cleaning kits, etc. All Pelican Protector Cases are listed with interior and exterior dimensions, so you can’t blame the company if you buy a case only to learn that your firearms and all your gear won’t fit inside. 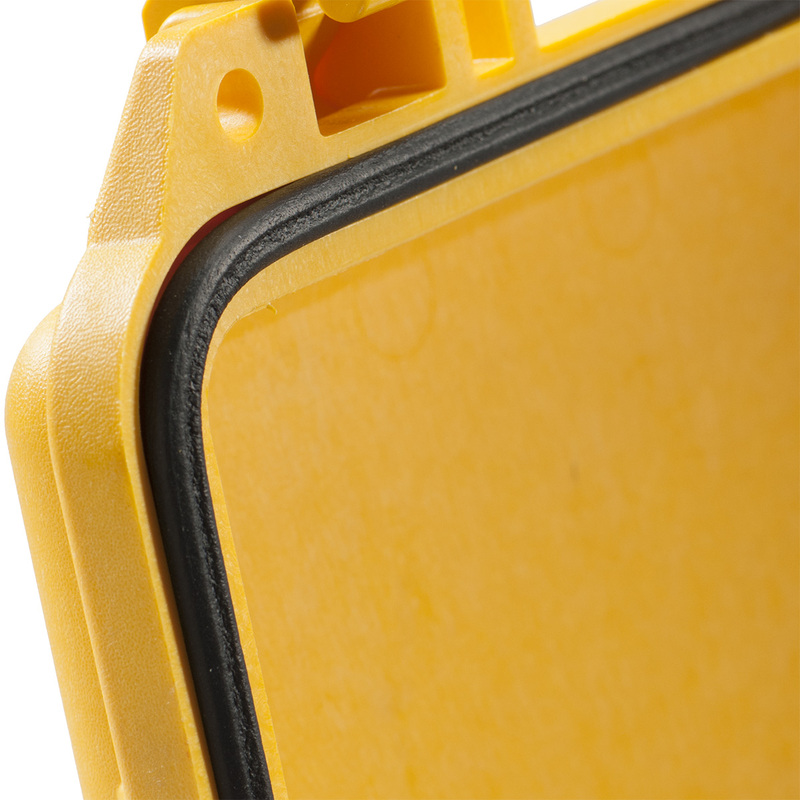 Customizable Pick N Pluck™ Foam is available for any Pelican Protector case except for the 1700 long case series. This foam allows you to customize the shape of the foam. The foam is precut into small cubes, and all you have to do to make it fit your specifications is trace the object that you want to fit on the foam and then pull out the pieces to make the shape. You can make the outline with a marker, or use pins or toothpicks. 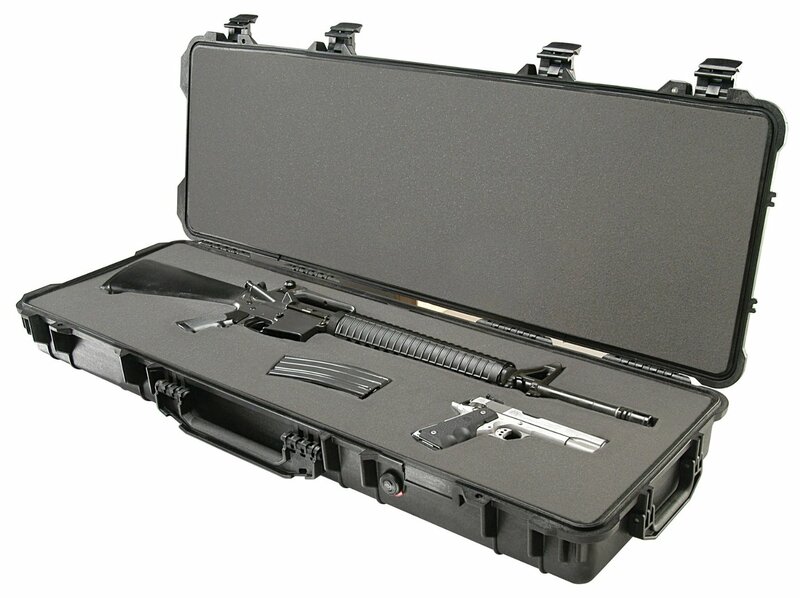 Pick N Pluck foam isn’t available for Pelican rifle cases. There is a process that you have to go through to get that professional shape that holds your firearms snuggly. The guys over at Innovative Defensive Solutions put together a demo video on how it should be done. It’s a good feeling to know that, no matter how high the reputation is for a product manufacturer, you have a warranty to fall back on. 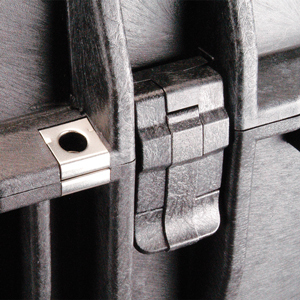 Pelican guarantees its injection molded products against breakage and defects for a lifetime. While often marketed as a case for tablets and tiny laptops, the Pelican P1075 is perfect for pistols, revolvers, and magazines. 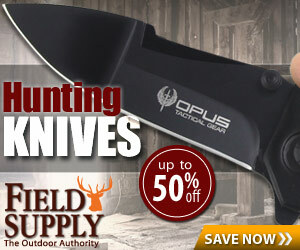 The Pick N Pluck foam, watertight O-ring, and lockable hasps will keep your firearm secure. It’s crushproof and dustproof, and since it can withstand temperatures between -10 to 120, you can feel safe carrying it anywhere. The P1075 also comes with a comfortable shoulder strap. 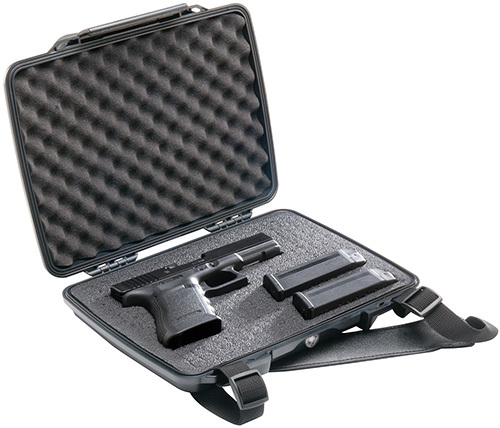 The Pelican 1170 Protector Case gives your treasured pistol ultimate protection. This is the gold standard of Pelican’s Protector series when it comes to keeping your pistol safe and secure. You’ll get the same watertight integrity and air pressure stability you’d get with any Pelican product. The Pick N Pluck foam will cradle your pistol and accessories regardless of shape. Temperature protection ranges from -40 to 210 degrees. While billed as a camera case, the Pelican Protector 1500 is the perfect hard protection for a pair of pistols (or three, if they are small). This medium-size case is three inches deeper than the 1170, so there is plenty of room for you to set up the interior foam in any fashion that you wish. And you still get the crushproof, dustproof, and watertight protection you need to keep your babies safe. It can withstand temperatures as low as -40 and as high as 210. The Pelican 1700 is the no-nonsense solution for rifle and shotgun protection. As the base model of the series, the 1700 gives you watertight and crushproof security that you can take virtually everywhere. It comes with a pair of wheels on the short side opposite a handle, so it is easy to transport anywhere you need to go. It has easy-throw double latches, as well as stainless steel hardware and padlock protectors. The case itself weighs just under 17 pounds with three layers of foam, and it can withstand temperatures that range between -40 and 210 degrees. With seven inches more interior length than the 1700, the Pelican 1720 long case gives you the room to add more accessories with your rifle. You could add a pistol, magazines, optics, or just about anything you can fit inside. Watertight, crushproof, and dustproof, you get the protection you demand. Weighing in at under 19 pounds with the foam and wheels, it won’t feel like you’re carrying much of a burden. 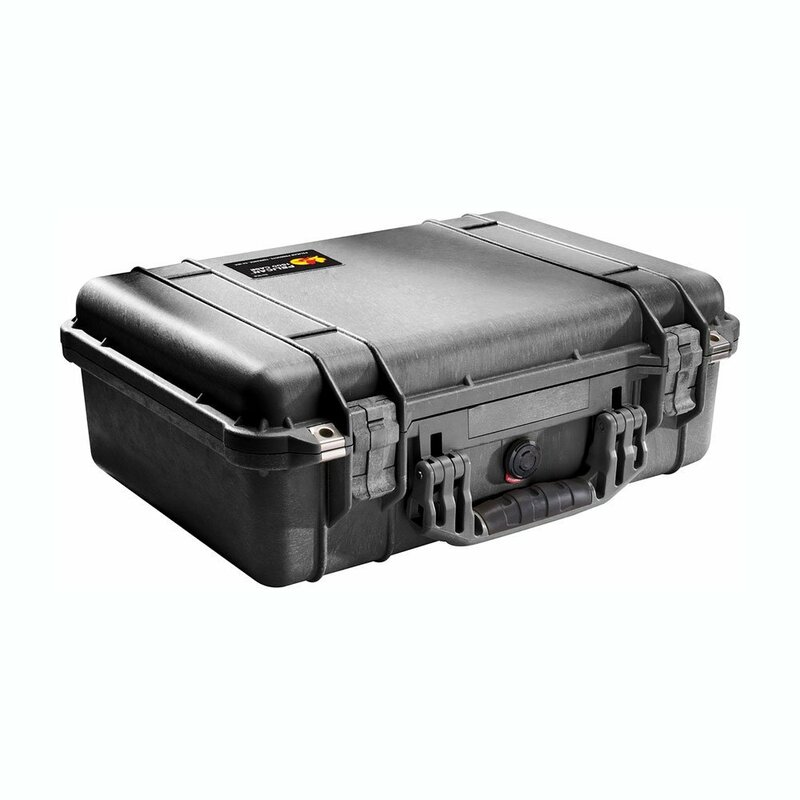 The Pelican 1740 Protector Case is truly a vault that will secure an entire cabinet full of rifles and long guns, as well as any other sensitive or fragile equipment that needs extra care when traveling. Scopes, cameras, tripods… you name it. Watertight, crush-proof, and dust-proof, you’ll always be prepared right out of the box. No matter the size of your firearms, Pelican has you covered with this bad boy. The Pelican 1750 Protector Case gives up to two rifles and their gear the ultimate protection. Plenty of room for scopes, magazines, and even a pistol or two. The watertight O-ring seal, crushproof case, and air pressure valve truly make this the case the top of the line. It weighs just over 25 pounds including the three-piece foam. And even through you have it filled to the max, you don’t have to worry about bumping into anything. The case will keep its contents safe and secure, and the wheels make it easier to transport anywhere. 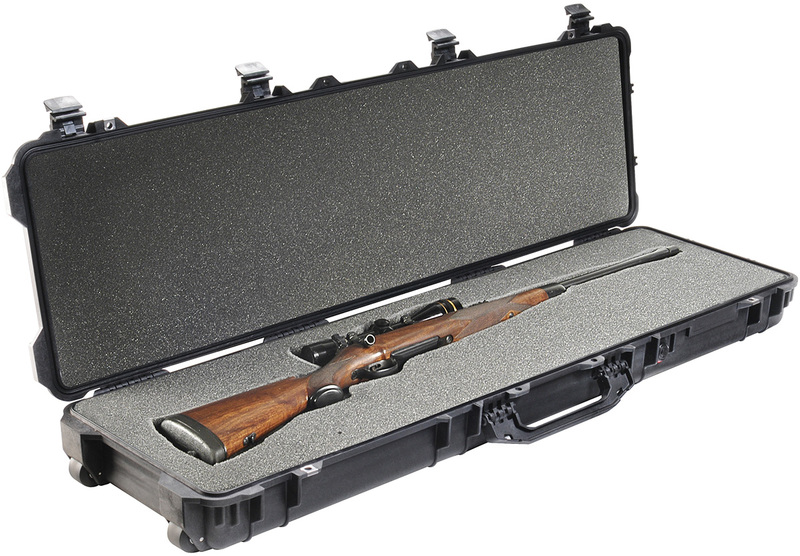 If you have a pair of long guns, this is perhaps the best hard case you can buy. 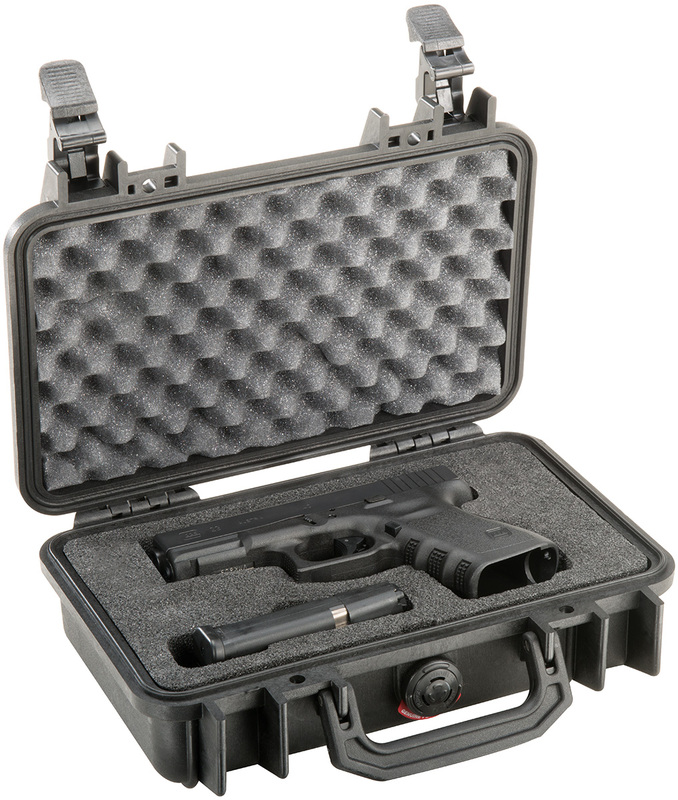 Pelican Protector gives you all the protection you could want in a hard gun case. The crushproof exterior, dust free interior, and watertight seal will keep any firearm safe from the elements no matter if you take to the shooting range on a hot day or to the hunting camp on a rainy autumn morning. It’s easy to find the right one for your needs. Pelican has one that will fit. And if you haven’t found what you’re looking for, I suggest you take a look at my shop, which is full of suggestions. I’m just some guy who loves hunting and fishing and has a hard time saying no to someone who offers a good deal on a gun. If any of the above describe you, then we probably have a lot more in common.